INDIA’S MAJOR PORTS SUSTAIN TRAFFIC GROWTH - Global Business Link, Inc. The eight major ports in India have recorded a healthy growth rate of 3.27% during the six month period April to September, 2017. Combined, these ports – Kolkata, Paradip, Chennai, Cochin, New Mangalore, Mumbai, JNPT and Kandla – handled 383 million tonnes of cargo, compared with 371 million tonnes handled during the corresponding period of previous year. The highest rate of growth was achieved by the port of Cochin, which saw throughput rise by 17.66%, followed by Kolkata, New Mangalore and Paradip, all of which grew by about 12%. Cochin Port’s growth is mainly attributed to an increase in petroleum, oil and lubricants (POL) traffic, which surged by almost 25%, as well as an 11% upturn in container volumes. 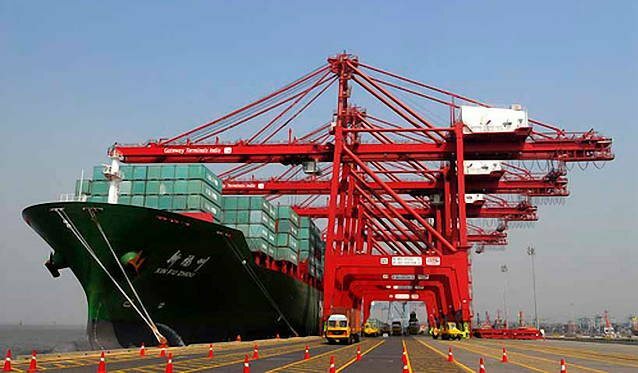 During the first half of the financial year, Kandla Port handled the highest volume of traffic, at 63.13 million tonnes, giving it a 16.49% market share, followed by Paradip with 55.78 million tonnes, JNPT with 37.90 million tonnes, Mumbai with 36.72 million tonnes, and Visakhapatnam with 35.74 million tonnes. Together, these five ports handled around 60% of major port traffic in India.